Clin Cancer Res, 2017, 23(21):6661-6672. Capmatinib (INCB28060) purchased from Selleck. 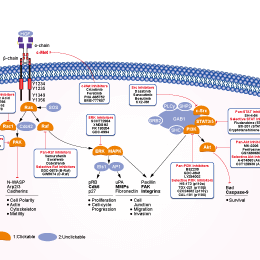 (B) Suppression of KIF5B-MET kinase activity by crizotinib was found to affect KIF5B-MET and associated downstream signaling pathways by western blotting. Neoplasia, 2018, 20(8):838-847. Capmatinib (INCB28060) purchased from Selleck. (a) MTS assay for the treatment of selected MET-subclones (2+3) and EMT-subclones (4+10) with the MET-inhibitor capmatinib. The cell lines are listed as they appear in the figure. All absorbance values were normalized to the absorbance for the control samples of the individual cell line. EMT- and MET-subclones responded significantly different to capmatinib treatment at 8 nm (P<0.0121). Oncogenesis, 2017, 6(4):e307. Capmatinib (INCB28060) purchased from Selleck. (a) MET inhibition by INCB28060 prevents HGF-induced MET phosphorylation in MDA-MB231 and HCC-1954 cells. After one hour preincubation with INC2B8060, BC cells were stimulated with HGF for one hour. Phosphorylation of MET and total MET were determined by western blot and quantified by densitometric analysis. Results are expressed as percentage of unstimulated and untreated cells (negative control). 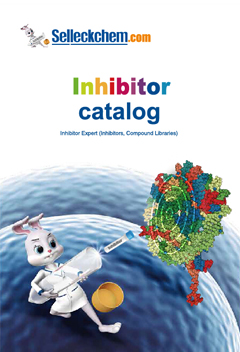 PLoS One, 2016, 11(3):e0150507.. Capmatinib (INCB28060) purchased from Selleck. Inactive against RONβ, another member of the c-MET RTK family, as well as EGFR and HER-3 (members of the EGFR RTK family). H441 cells are seeded in RPMI-1640 medium containing 10% FBS and grown to complete confluence. Gaps are introduced by scraping cells with a P200 pipette tip. Cells are then stimulated with 50 ng/mL recombinant human HGF to induce migration across the gap in the presence of various concentrations of INCB28060. After an overnight incubation, representative photographs are taken and a semiqualitative assessment of inhibition of cell migration is conducted. Animal Models: Eight-week-old female Balb/c nu/nu mice (Charles River) are inoculated subcutaneously with 4 × 106 tumor cells (S114 model) or with 5 × 106 tumor cells (U-87MG glioblastoma model). Formulation: INCB28060 is prepared as a 5 mM stock solution in 100% dimethyl sulfoxide and routinely stored at room temperature. Administration: INCB28060 is orally dosed, twice each day. Liu X, et al, Clin Cancer Res, 2011, 17(227). 7127-7138. JNJ-38877605 : ATP-competitive inhibitor of c-Met with IC50 of 4 nM, 600-fold selective for c-Met than 200 other tyrosine and serine-threonine kinases. Phase 1.